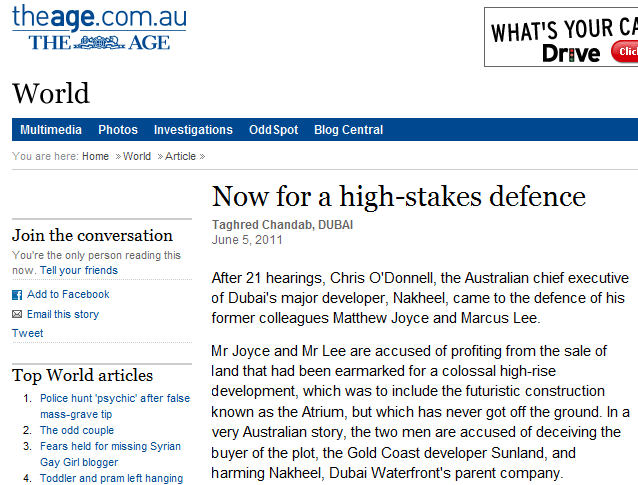 After 21 hearings, Chris O’Donnell, the Australian chief executive of Dubai’s major developer, Nakheel, came to the defence of his former colleagues Matthew Joyce and Marcus Lee. Gold Coast developer Sunland, and harming Nakheel, Dubai Waterfront’s parent company. Since their arrest in January 2009, Mr Joyce and Mr Lee have maintained they are innocent. Their passports confiscated, neither allowed to work, they are trapped with their families in a city where food prices are soaring and rent remains expensive despite the property crash. If convicted, the men could face long jail terms in the Middle East. Mr O’Donnell’s testimony may be crucial in proving the sale and value of Plot D17 was approved by Nakheel’s executive committee and there was no deception. Mr Joyce was Dubai Waterfront’s managing director and Mr Lee its commercial manager. What Mr O’Donnell said in court directly contradicted the Dubai prosecutor’s claims that Nakheel lost millions as a result of the $60 million sale. from Mohammad Mustafa, of the Dubai government’s Financial Audit Department, concluded that Mr Lee did not receive any money; nor did he benefit or gain from the transactions. This entry was posted on June 9, 2011 at 02:23	and is filed under Chris O Donnell CEO Nakheel Dubai, Dubai Justice, Nakheel. 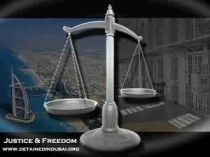 Tagged: Dubai, Dubai Justice, Nakheel, Sunland. You can follow any responses to this entry through the RSS 2.0 feed. Both comments and pings are currently closed.